This is slide 3 of 60 from the EXOSAT slide set. The following caption is the one originally provided with the slide set. 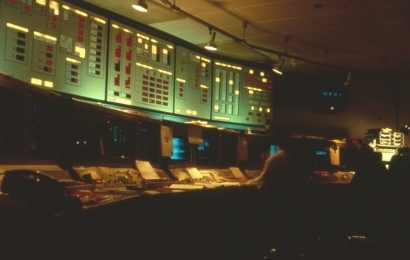 The EXOSAT dedicated control room at the European Space Operations Centre [ESOC] in Darmstadt, Germany, during the operations (May 1983 - April 1986). The satellite was operated in a manner very similar to ground based telescopes.